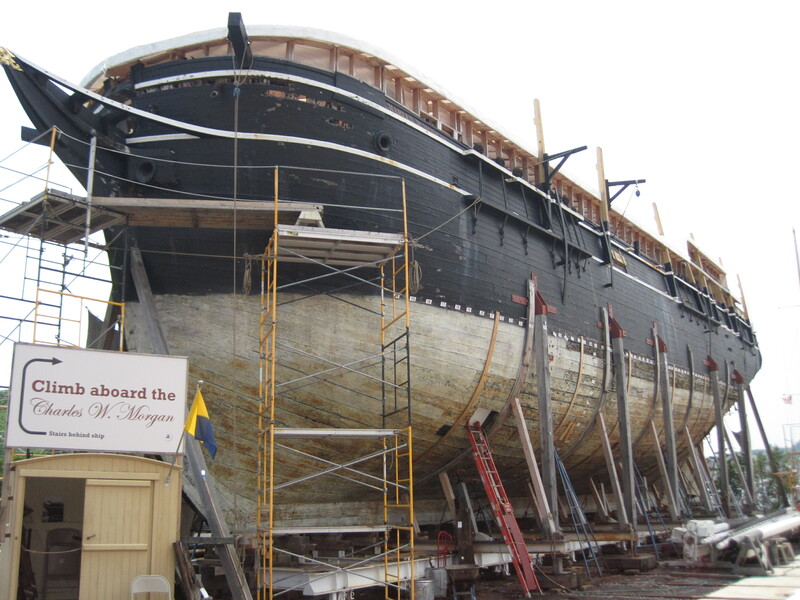 The Mystic Seaport museum in Connecticut launched in late July the sailing whaleship „Charles W Morgan”, allegedly the oldest and only remaining whaleship in the world. 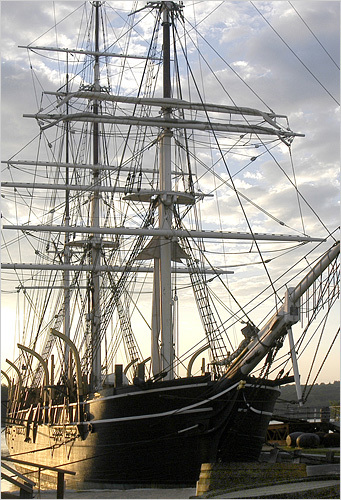 The „Morgan” was originally built in 1841 in New Bedford, Massachusetts when New Bedford and the adjacent area was then a major, and very prospering, whaling center worldwide. Like the wooden ships of her time, her expected life – between the dangers of limited maneuverability depending heavily on weather elements, cannibals and mutiny, Arctic ice and Confederate raiders, fire, woodworms, saltwater, was not expected to top twenty years, but it turned out that the „Morgan”, despite her many close calls, she ended up making an unheard of 37 voyages during eight decades of prime commercial life (average voyage duration was about four years.) Some interesting ‘personal’ accounts of her original ownership and the early restoration efforts can be found here. 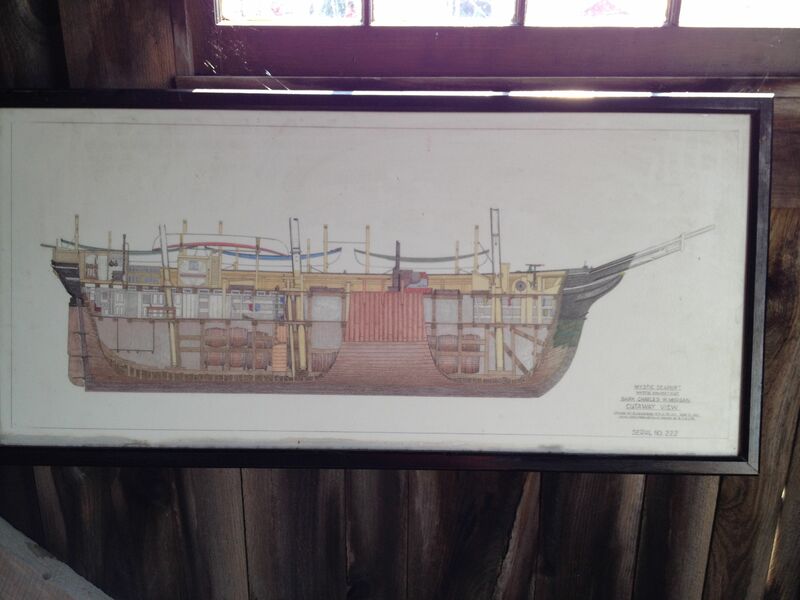 It cost about $27,000 to built the vessel at the yard of Jethro and Zachariah Hillman, and about another $26,000 to outfit her, about $1.5 million in total in today’s money. Her least profitable trip made about $200,000 while her most profitable trip brought in about four million dollars, all at today’s purchasing power again. Over her trading career, she generated more than $32 million in gross profits (at today’s PPP), mostly in the form of sperm oil, a waxy ester (prized as illuminant because of its bright, odorless flame), and whale oil made from the blubber of baleen whales (used for the production of soap, margarine and as cheaper illuminant due to her darker flame and fishy odor.) At 110 ft long, 27 ft beam and 17 ft draft, she had three decks, sailing capacity of 13,000 square feet and with about 35 crew, she was classed as a 351 ton whaling ship. She could hold 3,000 barrels of 31.5 gallons each; given that, on average, each whale could fill fifteen barrels, each of the voyages meant the life of 200 whales, implying that the ship has been the production plant (and graveyard) of 7,000 whales. Just one ship. We are of the opinion that killing whales is a despicable practice in our days and ought to be banned altogether, but we have to admit that whaling was ‘big business’ a couple of centuries ago and the industry has been the cause for advancement of naval architecture and navigation, exploration and trade, and a pillar of the development and growth of most of the New England area in the USA and many other ‘clusters’ for the trade worldwide. 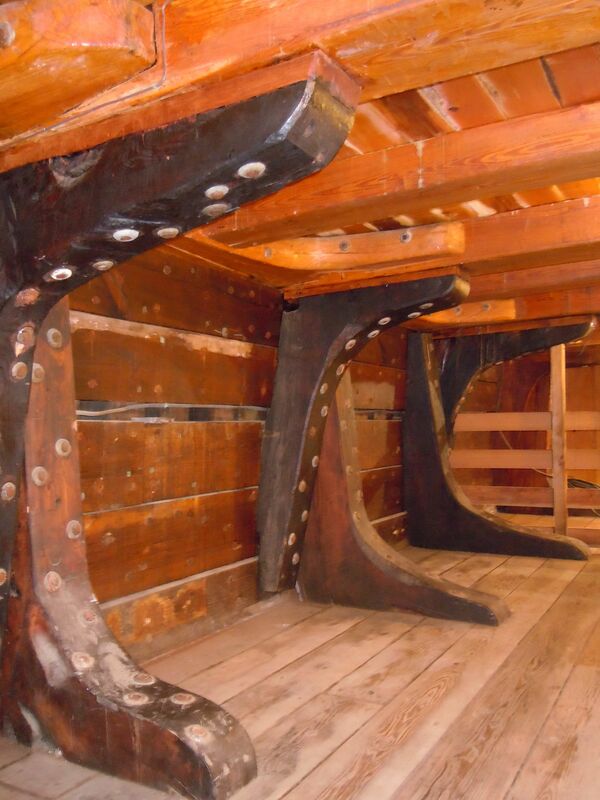 We feel strongly and enthusiastically about the Mystic’s diligent work to rebuilt and restore the vessel to her original condition based on tools and craftsmanship technique from the time of her original construction. The restoration so far has taken more than five years and has cost about seven million dollars employing 60 people. Imagine, if you please, what would be to sail on the vessel at her time: thirty five crew members packed in quarters no larger than two bedrooms, sailing around the Cape Horn for four years, away from families and loved ones, living on rations, no fresh food and vegetables onboard, with potable water stored in wooden casks for months, no bath, shower or toilet (just a ‘head’) battling the elements of nature, harpooning whales from the four small whale boats, towing the poor humongous beasts to the mother vessel, manually cutting, mincing, lifting, ‘trying out’ huge chunks of the meat, working on your knees and soaked in blood and fat (the decks of the vessel were not high enough to stand up, in order to preserve space.) With the exception of the captain and the first officer, a modern observer could justifiably say that being on the ship at such time was sort of voluntary indenture. How many things have changed since then? The ships; the people; the culture and the morals; ethics and what’s ‘right’ and ‘wrong’; major trades and industries important to local societies and even nations… Ships always have a story to share… from the people who dreamt of them, to the people who built them, to the people who sailed on them, to the people who serviced them, to the people who restored them way past their trading life. We should take a minute listen to their sort of ‘Siren song’! Unless otherwise stated, images are provided by Karatzas Marine Advisors & Co. No part of this blog can be reproduced by any means or under any circumstances, in whole or in part, without proper attribution or the consent of the copyright and trademark holders. This entry was posted in Maritime History and tagged Basil M Karatzas, Charles W Morgan, Karatzas Marine Advisors & Co., maritime history, maritime museums, Mystic Seaport, New Bedford, New England, tall ships, whale hunting, whaleship on August 31, 2013 by Karatzas Marine Advisors & Co..
China’s intended policy to ‘rebalance’ their economy with a greater focus on consumption rather than investment logically could have a negative impact on shipping, especially for large vessels that transport raw commodities to China such as capesize vessels. As more money is being spent domestically on consumer products and services, including either domestically procured or imported luxury goods, where there is more ‘value added quality’ than rudimentary processing of raw materials such as for real estate and infrastructure, big dry bulk vessels may be set for a tough few next years. A recent article in the New York Times on the ‘credit crunch’ and curtailing some of the ‘shadow banking’ may be an early precursor of what is to be expected. The price of iron ore, the commodity with the highest seaborne trading volume after crude oil, over the last decade has increased threefold, primarily due to China’s insatiable demand due to urbanization and infrastructure-building spree. Iron ore with 62% ferrous content delivered to Tanjin has been quoted presently at about $130 per ton, a 20% improvement since May alone, when China embarked on a buying spree of the commodity in order to primarily replenish inventories. Mining companies have been planning a $250 billion investment in order to expand capacity; most of the investment is planned by the industry’s major (and most bankable / competent) players, like Rio Tinto Group (RIO), Vale SA and BHP Billiton Ltd. (BHP), which implies a high degree of diligent execution and delivering of the projects on time. Given the lackluster world economic growth and China’s decelerating economy, most analysts expect a glut in the iron ore supply with prices set for a decline to levels around $100 per ton, on average, over the several years; some analysts even expect that temporarily iron ore may dip well below the $100 / ton mark, meaning rather bearish prospects for the commodity. As a general rule of thumb, bear commodity markets imply bear shipping markets, correspondingly, since there is a very high degree of correlation. Just to re-ascertain the point of a bear iron ore market may not be good for the capesize vessels, most of the investments and the planned investments for increasing iron ore capacity are taking place in West Australia. In a recent report produced by Goldman Sachs, seaborne supply of iron ore is expected to grow from an estimate of about 1,150 mtpa in 2013 to approximately 1,500 mtpa in 2017, for an overall 30% increase. However, during the same interval, seaborne iron ore supply from Australia is expected to by 44% while from Brazil by ‘only’ 30%. Nothing shabby with these growth rates – as long as you are not a mining company, but, really not a cause to pop a champagne bottle for a shipowner. As anyone can quickly ascertain by taking a look at a world map, Australia is much closer to China than Brazil, and it takes three times more ships to transport the commodity from Brazil than from Australia to China. On August 16th, the Baltic Exchange in its daily report was posting the ‘C3 route’ Tubarao-Qingdao at $20.73/ton while the ‘C5 route’ W Australia-Qingdao at $9.01/ton. While over the next five years seaborne iron ore supply is expected to grow by 30%, the supply of capesize vessels (about 180,000 dwt) and Very Large Ore Carriers (VLOCs) (>200,000dwt) is expected to grow by 13% in the next three years, based on firmed, confirmed orders by bankable players (and thus high certainty of actual delivery of the vessels). This again is the firm, known supply, and with the shipbuilders with plenty of spare capacity and desperate need of new orders, it could easily be revised upwards. Not to mention that if iron ore gets cheaper, so it will be the case with newbuilding vessels, which could lead to another round of increased newbuilding frenzy. And, this, at a time when capesize vessels have been averaging $9,000 pd in the freight market, barely sufficient to cover their daily operating expenses (the less said the better on their financial cost, since some such vessels were bought for more than $100 million, and an ‘average’ term amortizing mortgage would presume more than $25,000 pd payment). 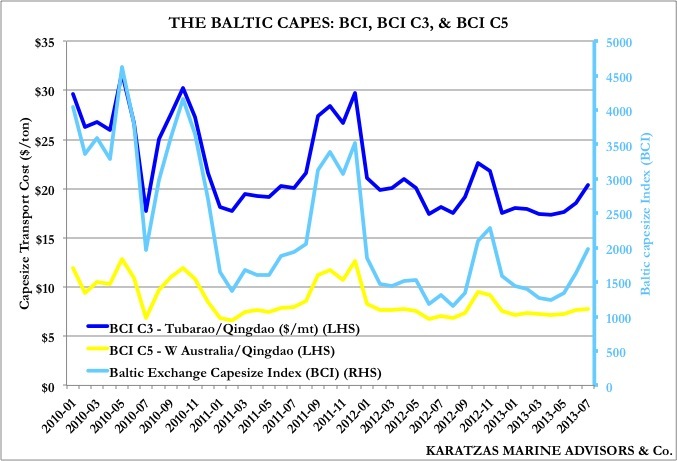 This entry was posted in Shipping Market Economics and tagged Baltic Capesize Index, Basil M Karatzas, BCI, BLOC, cape, capesize vessel, China, iron ore, Karatzas Marine Advisors & Co., mining companies, Qingdao, rebalancing, Tubarao, Vale on August 18, 2013 by Karatzas Marine Advisors & Co.. The shipping supercycle of the last decade was riding on the coattails of the commodities supercycle and China’s incorrigible demand for raw materials due to its investment boom. 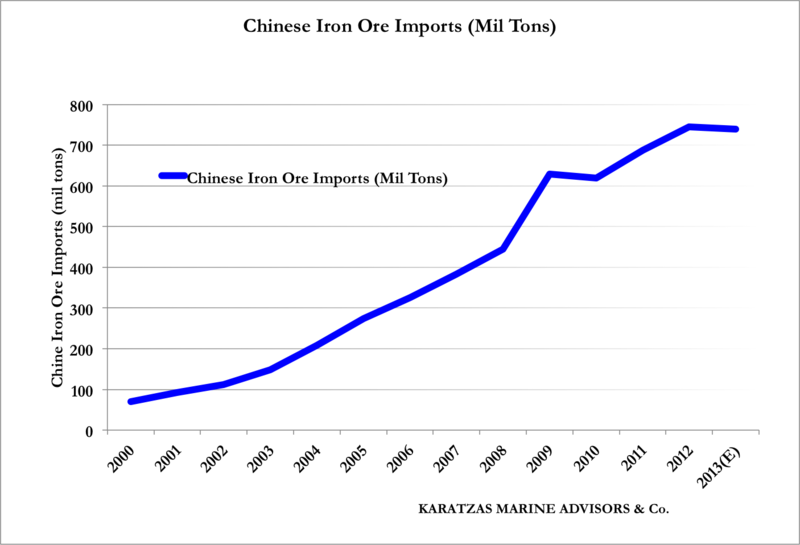 Primarily minerals like iron ore and coal (with the dry bulk market as a beneficiary) and crude oil (with the crude tanker market as a beneficiary) experienced very strong growth based on China’s strong demand, with a brief case in point of the following graph depicting Chinese iron ore imports increasing from about 70 million tons in 2000 to about 745 million tons in 2012, for an approximate CAGR of 20%. So far, so great! The heavily construction-driven Chinese growth has resulted in many excesses in the economy (and in many other aspects of life and society, including politics.) Focusing on the economy here, residential construction represents 20% of the Chinese GDP, according to a recent presentation by James Chanos of Kynikos Associates, one of the few successful short strategy hedge funds. By comparison, at the height of the US real estate bubble, residential construction represented about 6% of the US GDP. Even scarier, in 1989, at the height of Tokyo’s real estate bubble, real estate was valued at 375% of GDP, while in 2007 in the US, real estate was valued at 180% of GDP; by comparison, today’s price of real estate in China stands at more than 400% of GDP. As China, at present, tries to contain a potentially ‘banking bubble’ and rebalance its economy away from investment and toward retail consumption, the impact on the rest of the world can be tangible. As Paul Krugman discussed recently in an article in the New York Times recently, China’s reaching the ‘Lewis point’ when additional capital on investment starts to generate diminishing returns (underemployed ‘surplus labor’ from the country side has only marginal contribution to the overall economic output, as new industries cannot efficiently depend on cheap, untrained peasant labor drawn from the mainland), it will have to focus on domestic consumption. Focus on internal consumption will translate to a need for lower imports of raw materials, and as China – the largest world importer and consumer of commodities – curtails its imports, the impact on shipping, especially on the asset classes most dependable on the ‘China play’ like capesize bulkers and VLCC tankers will be tangible. Of course, China has made a name of itself surprising the world in the last decade, mostly positively, and many Cassandras so far have been proved wrong. Regrettably, even when excluding a catastrophic scenario of ‘bubble bursting’ and focus on the likely scenario of ‘soft landing’ with a manageable rebalance of the Chinese economy and tapering off of raw material imports, the prospects for certain types of shipping do not seem so great; there are still 80 VLCCs on order to be delivered (with the world fleet standing at about 650 vessels) and 180 VLOCs/Capesize vessels (with the world fleet standing at about 1,400 vessels). No part of this blog may be reproduced, in whole or in part, under any circumstances, without the prior written consent of the copyright holder of this blog. 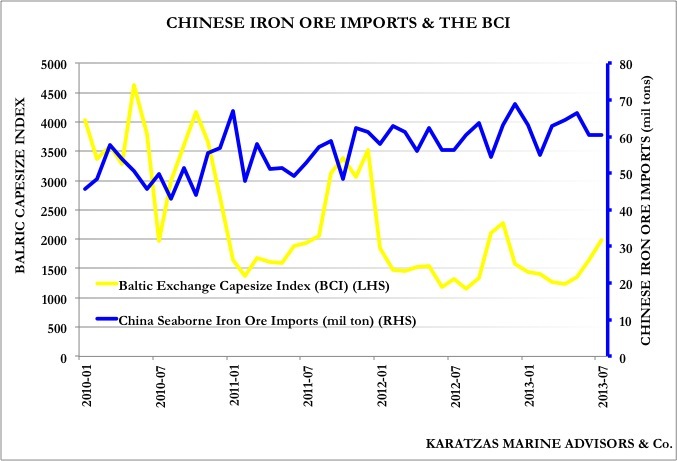 This entry was posted in Shipping Market Economics and tagged Basil M Karatzas, China, Chinese iron ore imports, commodities, commodities cycle, dry bulk market, Karatzas Marine Advisors & Co., Rebalance, soft landing, tanker market on August 15, 2013 by Karatzas Marine Advisors & Co.. In a chart in a previous posting, we noted that newbuilding orders placed so far in 2013 are already more than the orders placed in the whole calendar 2012. A proxy index for the market (BDI) in the same graph indicates that we are not faring much better in terms of freight level since last year. So, why the excitement? The recent newbuilding wave cannot be attributed to any factor alone; however, ever since post-Lehman collapse, many factors have been simmering and eventually are finding an escape valve in the newbuilding market. For starters, after the collapse, every shipowner and institutional investor worth their salt, they have been salivating about ‘cheap ships’, ‘distressed sales’ and the great number of vessels the bankers would be auctioning on an industrial scale. By now everyone knows that that ‘dream boat’ of business never came to port. The banks held onto the assets, and the ‘cheap ships’ that were sold were few and between, especially if one focuses on good quality, market competitive tonnage. And, the shipbuilders, who quite a few of them were picking off the shelf designs and started experimenting on a commercial basis (aka ‘greenfield yards’) during the bubble, thought that if they were to manage to convince anyone to sign a new contract in a bad market, they better had to come up with improved designs. We heard of 30% efficiencies, etc, but once all is said and done, all else being equal, on average ‘eco designs’ are about 10% more fuel efficient than ‘average’ vessels. Still, 10% in savings in fuel for a small handysize bulker burning about twenty tons per diem, the savings are about $1,500 pd (nothing to sneeze at when freight rates are below $10,000 pd), savings that nominally add up to $14 million over the vessel’s life (nominally about 60% of a newbuilding’s price). Just imagine what that 10% in fuel savings means for a big vessel that consumers five times as much bunkers as our Lilliputian ‘handy’. And, the shipbuilders didn’t stop at the ‘eco design’. The sweetened the terms for newbuilding contracts with back-loaded payment structures (30% on signature and 70% on delivery, instead of a more gradual and traditional ‘progress payment’ structure of 5×20% at meeting certain construction milestones.) And, why not, they even got their perspective governments to provide export credit to their qualified buyers, and, in other instances, managed to pocket a few subsidies for themselves as well. After all, they were creating jobs, and helping keep the market oversupplied with vessels (not a goal to be ignored to countries like China). And then, there were the central bankers worldwide priming the system at levels unforeseen in history, probably for good reasons given the financial scare ensuing the Lehman collapse, keeping interest rates at very low levels; and, more importantly, promising to be doing so for the foreseeable future and ‘at any cost’, using emphatic language to ensure that all got their point crystal and clear. Low interest rates reflectively also mean that the ‘opportunity cost’ for the cash rich buyer is small enough to be ignored, which makes the prospect of a newbuilding even more enticing. And, while in previous downcycles the market was dominated by strategic players like the shipowners, the cargo owners and the shipping banks, this time things are indeed different. Quite a few of entrants to the market, and some of these new entrants to the market are with deep pockets that could make even rich private shipowners look like paupers, are institutional investors and private equity funds that have raised or have access to multi-billion dollar pockets of money. So, there is a market when vessels in the secondary market should be cheap but no there is no activity on grand scale, when the market index is less than 10% of its peak (see graph) implying both that sooner or later has to improve and also that till then the ‘revenue forfeited’ will be smal , when the payment structure for newbuildings is favorable and the financing cost low, when the Siren Song of the ‘eco designs’ promises that fuel efficient vessels will crowd out their older siblings even in an oversupplied market when vessels will be idling, and, finally, when in two years we will be reaching the average shipping cycle length (two years is just about the time to get a new order materialize in the form of a new vessel), one can only start appreciating the newfound excitement for newbuildings! This entry was posted in Shipping Market Economics and tagged Baltic Dry Index (BDI), Basil M Karatzas, export credit, Karatzas Marine Advisors & Co., newbuilding contracts, progress payments, shipping banks, shipping finance, tonnage oversupply on August 12, 2013 by Karatzas Marine Advisors & Co..